Refresher course – Part 1, Part 2 and Part 3. It has been so long since we visited this series that this update will encompass three different styles used in the late 80s. After this, we will look at Italia 90 and that was something of a mother lode for GK shirts, so it’ll be split into two. The diagonal design which Part 3 focused on had its high point at the 1986 World Cup in Mexico, but even then it was being superseded. While the cut and the collar stayed the same, the fabric pattern was altered, with the uniform stripes replaced by an irregular miscelleny of shapes. What was also different was that the tonality was darker, whereas the diagonals were lighter than the body and sleeves. For shorthand, we’ll call it the geometric pattern and it’s one we’d most associate with Soviet Union goalkeeper Rinat Dasayev, who always had the look of a conscientious journalist wrestling with his conscience as to whether he should break a story which might bring down a government. He was one of those to premiere the new look in 1986 and still had it two years later, captaining the USSR to the Euro 88 final. Generally, he favoured yellow but often wore it in blue too. Harald Schumacher, and later Bodo Illgner, used those two colours as well but, as with the previous style, West Germany lived up to the organisational stereotype and had a red version ready for use if needed. Grey was favoured by Hans van Breukelen, who was between the sticks as the Netherlands won the European Championship. Also in yellow and blue on occasion was Belgium’s Michel Preud’homme but, pleasingly, the adidas stripes on his shirt were the same as on the country’s white away kit, featuring the colours of the national flag. Another variation was seen on Norberto Scoponi of Argentinean side Newell’s Old Boys. 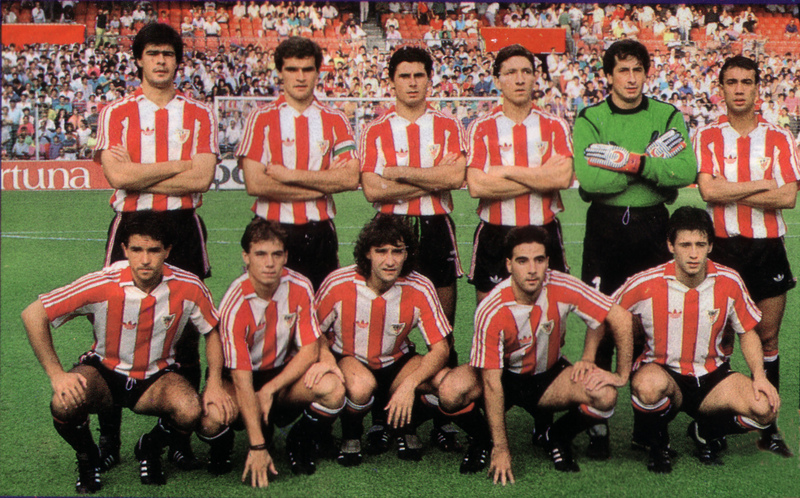 As well as the (wider) white collar and sleeve stripes (three individual stripes, as opposed to the five-stripe strip used in Europe), this also featured the pattern on the sleeves. As mentioned in Part 3, France’s Joel Bats retained the horizontal pinstripes for Euro 84 rather than wearing the diagonal stripes, and he was late to this part too. While he would wear it for some Euro 88 qualifiers, in Mexico he had a unique design which we can’t find evidence of anyone else wearing. While it did have a tonal pattern, it featured rectangles and there were also black strips where the body met the sleeves, almost giving the effect of wearing a sleeveless windcheater. As mentioned above, adidas’s English clubs got a new look for 1987-88, but while it did feature on outfield shirts of teams like Bayern Munich, Bulgaria, East Germany and Sweden, as far as we can make out it wasn’t used by goalkeepers anywhere else. While on first glance it looked like the older diagonal stripes, this actually featured parallelograms arranged to look like stripes. Having had a plain yellow GK shirt with a red collar initially after signing with adidas – yellow goalkeeper shirts hadn’t been allowed in England in the past, apart from the national side – Liverpool’s Bruce Grobbelaar was back in the more traditional green. A change was required for two games against Celtic in April 1989, matches played for very different reasons, and the Zimbabwe international had two similar, but different, shirts. The first game was the grandly titled Dubai Champions Cup on Tuesday, April 4 – little more than a knees-up, incredible to think that such an exhibition was allowed in the run-in to the domestic season. Here, Grobbelaar wore a yellow shirt with black stripes but the collar and cuffs were a jarring white, as was the Candy logo with adidas and the club crest in red. Eleven days after that game was the Hillsborough tragedy, and at the end of April, Celtic generously arranged a match to benefit those affected. This time, the collar and cuffs were black, with Candy in red. In the summer of 1989, the new Liverpool kit featured a white ‘speckled’ effect and this was replicated on the goalkeeper shirt, which was something of a new departure (more anon). Arsenal and Manchester United kept the diagonal boxes but this time with raglan sleeves and white piping. Both had light-blue back-up versions but, given how few teams in England wear green, they weren’t needed that often. However, while United had a brand-new green and black goalkeeper design in 1990-91 (again taking cues from the new outfield shirt), there was no alternative colour and so, for the European Cup Winners’ Cup semi-final against Legia Warsaw, Les Sealey had to go with the previous look. Southport to be forced to use a third kit? It’s a weird one, HArry – not sure it was ever worn, though?